Visit us at the 2019 NRA Great American Outdoor Show in Harrisburg PA booth 5818 we will also be in OK, SD, LA, SC, and WI we look forward to seeing you all in Person!! Please sign the petition and review the information there. Thanks for contacting us. We are looking forward to helping you plan a great wolf or wolf combo hunt. We have had many wolf sightings over the years. We are really excited about being able to offer this hunt. Wolves are prevalent and clients see them frequently. We are already successful wolf outfitters in fact, our hunters have tagged several wolves already. Combo Lion and Wolf hunts and Wolf hunting alone will be offered in both our areas units 10 and 7. We are hoping to fill all quotas for wolf and plan to take folks in unit 7 until end of January and in unit 10 until the end of March. Unit 10 will remain open through June and we will be offering the Wolf and Bear Combination hunt through the end of June. With all the lion hunting in winter and intense spring bear hunting, summer pack trips and archery and rifle elk seasons - We spend an enormous amount of time in the backcountry and have patterned the habits of our wolves. help me do it. My hunters are having success on wolves incidentally already. I feel confident when I am focused on finding you a wolf we can be even more successful. My lion hunters have a long history of taking photos of wolves on their hunts let's turn that into hunting success! Call Inga for scheduling and hunt details. We are licensed for wolf in unit 7 - Panhandle and Unit 10 Lolo Wolf Zones. There are no quotas in either areat year - Please call to make the goal of full quota a reality. I have been waiting 12 years for this. It's the first legal wolf hunt in the lower 48 for around 80 years. Come and join me on this historic hunt. Wolf hunting Special $2700 5 day back country unit 10 or unit 7 hunt Plus tax and tags per person. Add Wolf to Bear hunting for $1000 plus tax. Lion and Wolf Combo hunts are $6500 plus t&t. 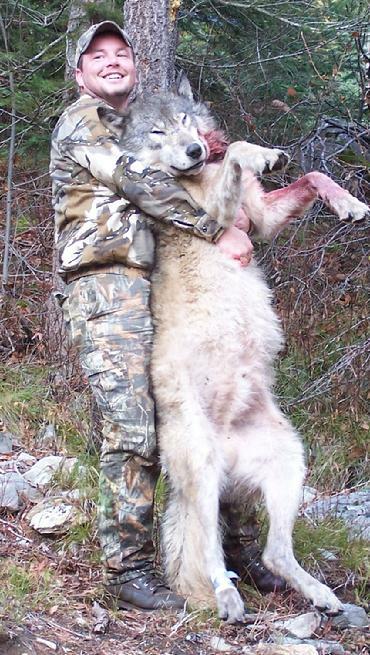 Call 208 245 2458 us to discuss this hunt and to plan a wolf or wolf combo hunt of a lifetime.